Haredi extremists put stickers with PLO flags on fire engine, as firefighters put out a blaze in Meah She'arim apartment. Firefighting crews that worked on Thursday evening to put out a fire in an apartment located in Jerusalem's Meah She'arim neighborhood were surprised to find anti-Israeli stickers with the Palestine Liberation Organization (PLO) flag stuck to their fire engine. Making the incident all the more troubling is that it took place on Israeli Independence Day. 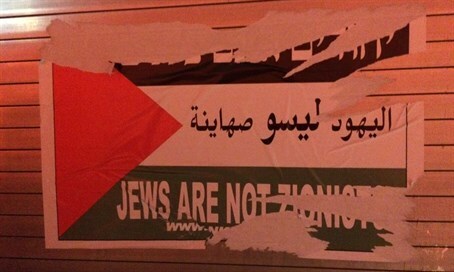 One of the stickers read "Jews are not Zionists" in Hebrew, Arabic and English, with the PLO flag in the background. The stickers had especially strong glue, and the crews were force to spend a long time trying to remove them until they finally succeeded in doing so with high pressured water from the fire engine's pumps. The incident comes after a similar provocation on Israeli Memorial Day, when anti-Zionist haredi extremists from Neturei Karta hung a huge sign in the center of Meah She'arim presenting haredim who enlisted to the IDF as fallen soldiers. Police forces were dispatched to remove the sign.